Here is a stat I thought I would see one day, I just wasn’t sure when. Paid downloads accounted for almost 30 percent of all music sold in January, bringing even closer the day when the sale of digital music outpaces the physical product. Here is another stat I thought I would see, I just wasn’t sure when. Apple’s iTunes Store has surpassed Wal-Mart as the No. 1 music retailer in the U.S., according to the NPD MusicWatch Survey (via Ars Technica). Pretty amazing, considering iTunes opened for business almost five years ago (April 18, 2003). 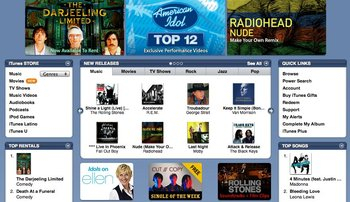 MP3.com, Cductive, eMusic, and others, were attempting to sell digital downloads before Apple, but it was the arrival of iTunes — in conjunction with the sale of iPods to Mac and Windows users — that legitimized online music. Ars Technica saw a copy of an email sent late today to some Apple employees; the email included a screenshot of an Excel spreadsheet showing the top 10 U.S. music retailers for January 2008. For the first time in its history, iTunes sits atop the list with 19 percent, Wal-Mart (brick-and-mortar stores and online) is second at 15 percent, with Best Buy third at 13 percent. Amazon is fourth at 6 percent, followed by physical stores and online services such as Borders, Barnes & Noble, Circuit City, and Rhapsody. iTunes’ ascent to No. 1 on the sales charts is not unexpected, but as Ars notes it does show how much the music industry has changed since the start of the decade — and where it’s headed. In 2007, the music industry suffered a 10 percent drop in overall music spending, according to NPD Group, a trend that’s expected to continue. Overall, however, paid downloads presses on and one of these days — sooner rather than later — I expect we will see the final stat we’ve been waiting for: Paid downloads accounts for the majority of all music sold in the U.S.
Apple succeeded where others failed simply by making it easier to buy than to burn, borrow, or steal. The integrated solution – the expansive storefront, the easy-to-use multi-platform software, AND the wide range of players combined to make a seamless toolkit for users. its really affordable when buying than to burning, you really know why.